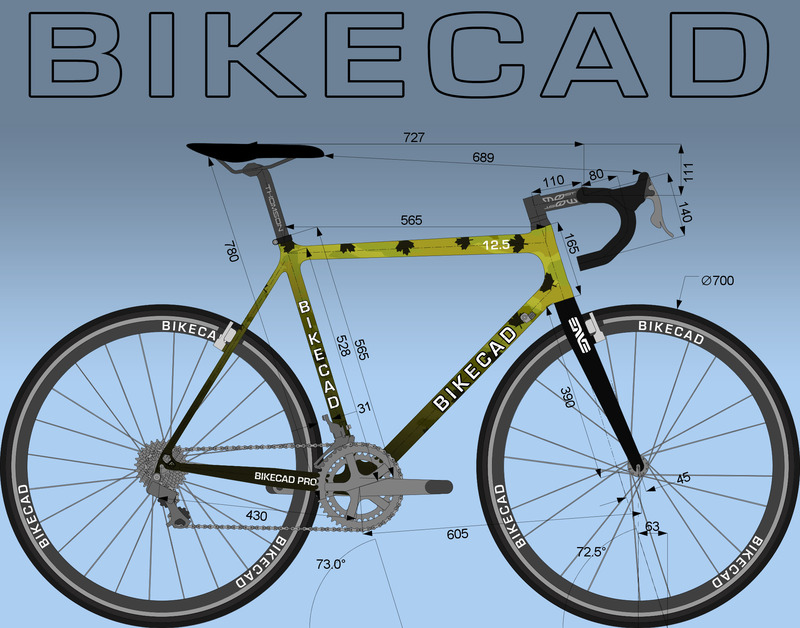 BikeCAD Pro is a standalone application for bicycle framebuilders, shops and fit specialists. The software runs on any operating system including Windows, Mac and Linux. Allows full access to the Fit Advisor along with the ability to customize the Fit Advisor formulas and interface. Generate multi-model PDFs to compare multiple frame designs at once. Import photos and underlay them behind the model for reference purposes. Routine tasks can be done more efficiently in BikeCAD Pro using Templates. Customize the BikeCAD Pro interface. Additional examples include changing icon size, look and feel, splash screen, title block logo. Paint palettes can be customized. Create libraries of standard parts. Gain full access to all dimensions in the Dimensions dialog box. Additional dimensions can also be added anywhere to your model using user dimensions. Markup your model with on-screen notes. BikeCAD Pro also displays several auxiliary views for displaying seat stays and chain stays, as well as lean angle, fork crown clearance and toe overlap. Take a snapshot of a current design and compare it with subsequent modifications. Investigate and fix problematic curved tubes. Check if your design complies with UCI regulations. Export miter templates capable of accounting for complex geometry presented by elliptical tubes, and variable diameter head tubes. BikeCAD Pro also generates various forms of output such as CSV files, animated GIFs, and fully dimensioned drawings in PDF, SVG, and bitmap form. Easily drag and drop designs into the BikeCAD interface. Save and retrieve designs locally or online. Determine the length of chain or belt drive required for any given design. The $500 cost of BikeCAD Pro is a one time fee. As new versions of the software are released, all owners of BikeCAD Pro receive the latest update for free. PROGRAM LICENSE AGREEMENT IMPORTANT NOTICE: Please read the terms of the following License Agreement carefully. Your use of the product signifies your acceptance of the terms of the Agreement. If you do not agree with the terms of this Agreement, you should promptly delete the package. Retain this License Agreement for future reference. Article 1: License Grant The software is the intellectual property of The Bicycle Forest Inc. and its licensors, and is protected by law, including Canadian copyright laws and international treaties. The Bicycle Forest Inc. grants to you a license: 1. To use the program on up to three machines. 2. If the software in this package is licensed as a Site License, it is licensed for use on several machines. Additional master copies of the software may be made by the licensee, equal to the number of licenses purchased. No reverse engineering. MAY NOT MODIFY, TRANSLATE, DISASSEMBLE, OR DECOMPILE THE SOFTWARE, OR ANY COPY, IN WHOLE OR PART. Article 2: Term The license is effective until terminated. You may terminate the license at any time by destroying the program together with all copies, modifications, and merged portions in any form. The license will also terminate upon conditions set forth elsewhere in this Agreement, and The Bicycle Forest Inc. may terminate your license if you fail to comply with this Agreement. You agree, upon such termination for any reason, to destroy the program together with all copies, modifications, and merged portions in any form. Article 3: Disclaimer of Warranties and Limitations of Remedies 1. BikeCAD software is licensed to you As Is. You, the consumer, bear the entire risk relating to the quality and performance of the software. In no event will The Bicycle Forest Inc. be liable for direct, indirect, incidental, or consequential damages resulting from any defect in the software, even if The Bicycle Forest Inc. had reason to know of the possibility of such damage. If the software proves to have defects, you, and not The Bicycle Forest Inc., assume the cost of any necessary service or repair. In the event any liability is imposed on The Bicycle Forest Inc, The Bicycle Forest Inc's liability to you or any third party shall not exceed the purchase price paid for this product. 2. THE LIMITED WARRANTY STATED ABOVE IS THE ONLY WARRANTY OR REPRESENTATION OF ANY KIND WITH RESPECT TO THE SOFTWARE MADE BY THE BICYCLE FOREST INC OR ANY THIRD PARTY INVOLVED IN THE CREATION, PRODUCTION, DELIVERY, OR LICENSING OF THE SOFTWARE. THE BICYCLE FOREST INC AND ANY SUCH THIRD PARTY DISCLAIM ALL WARRANTIES, EXPRESS OR IMPLIED, WITH RESPECT TO THE SOFTWARE, ITS QUALITY, RELIABILITY OR PERFORMANCE; OR ITS MERCHANTABILITY, NON-INFRINGEMENT OF THIRD PARTY RIGHTS, OR FITNESS FOR A PARTICULAR PURPOSE. Article 4: General You may not sub-license, assign, or transfer the license or the program except as expressly provided in this Agreement. Any attempt otherwise to sub-license, assign, or transfer any of the rights, duties, or obligations hereunder is void. This Agreement will be governed by the laws of the Province of Ontario, and you agree that any claims regarding the software shall be brought in Ontario, and waive any objections to jurisdiction in the Province of Ontario. BikeCAD Pro is governed by the following license agreement.